Ask any Retailer about their Carrier Bags, and they’ll tell you what a great communication vehicle they are. 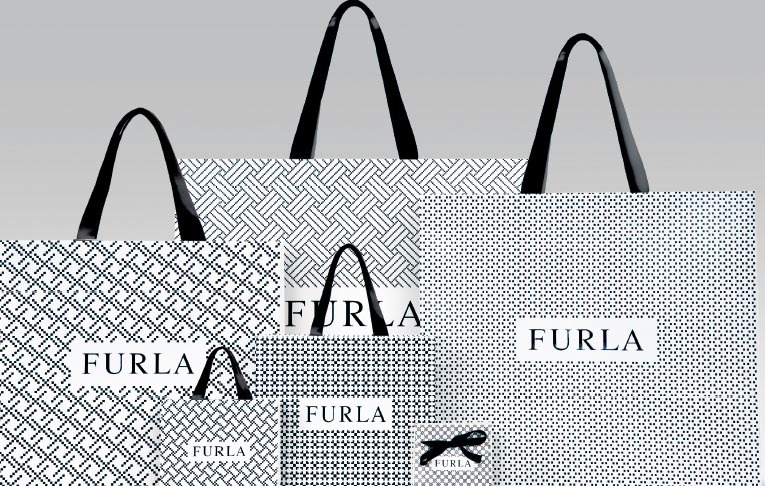 But FURLA, one of Italy’s premier accessories brands took things to a new creative level, when they transformed their shopping carrier bags into mobile art. from 250 sheets, filled with 250 different abstract patterns. In keeping with the Furla brand and its values, the artwork is an evocative reflection on the meaning of hand-craftsmanship. The abstract patterns are in fact meticulously hand-drawn which, when you look closely, reveal the constant fluctuation and chaos hidden beneath supposed regularity and order. The artist has continued to remain anonymous in order to give maximum prominence to the work, preferring to let it speak for itself. They chose to surrender their rights to the piece to Furla, trusting in the dedication the company has shown to world of arts for many years both through the the Furla Foundation and the Premio Furla Award. The new carrier bags have now been distributed throughout the brand’s significant worldwide network, appearing on the streets the world over, from New York to Beijing, Paris to Milan; a truly mobile art collection. These unique bags are an innovative way to bring art out of the galleries, exhibitions and museums to make it accessible to everyone. They also reflect perfectly, the fusion of fashion and art which continues to be the cornerstone of the Furla brand. Keenpac has worked with Furla since January 2003, supplying them with a complete range of retail packaging, including hand-finished carriers, jewellery and watch boxes, pouches, envelopes, ribbon, stickers, as well as their internet packaging. As one of the most luxurious forms of retail packaging, jewellery boxes can be a dark art to all but a few. We spoke to Keepac’s resident jewellery box expert, Dean Callier on just what makes a quality jewellery box.